Comfort food is always something we lean towards, regardless of what we are encountering in our lives. Recently, I have been craving salty and sweet bowls of warm and easy to eat comfort, without putting my heart and health at peril. This recipe can be done MANY ways, from the "cleaning out the fridge-kitchen sink" method, to a more planned one, to a thematic take on a culture and cuisine. I have eaten variations of this most days for the past week, and I have yet to grow tired of it (due to the variations one can incorporate). I have tried this recipe with various cheeses (from fat free Kraft singles, laughing cow, cottage cheese, ricotta, Gruyere, Asiago, Gouda, cheddar, Parmesan, Romano, Havarti, and homemade Alfredo, feta, baker's cheese, to vegan takes on all the above) and they have all been amazing. The essential aspect of this amazing meal comes from the variety of tastes and spices you add to it. I find that adding green onions to it (fresh) give it a distinct and Divine taste, while bell peppers and tomatoes provide color, sweetness, vitamins and Lycopene! Regardless, this bowl ends up being a cornucopia of nutrients and comfort. From the anti-cancer properties of the cabbage/cauliflower/broccoli Rainbow Salad base, to the veggies and spices you choose to add. For a Middle Eastern take, I recommend adding Curry and lots of Turmeric (also potent antioxidant, anti cancer and anti bacterial/inflammatory benefit s), cauliflower, goat cheese, and chick peas. My favorite variation thus far have utilized green onions, tomatoes, orange and red bell peppers, Mann's Rainbow Salad (Broccolislaw can be used as a substitute), baby carrots, cauliflower,wax and green beans, crisp romaine, Low Sodium Soy ,hot sauce , and Kraft fat free singles in Cheddar/Mozzarella, and Shirataki noodles , whole wheat pasta, fresh linguine/fettuccine (brown rice /soba /quinoa pasta , and gluten free pasta all work well! ), or Fiber Gourmet . 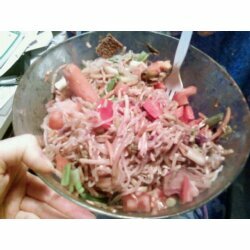 The key is to douse the Rainbow Salad with either Walden Farms Asian /or theirBBQ or Soy Sauce , and microwave for approx 10min. Season with any spice you like (I used Johnny's Seasoning ). In the meantime, chop up your veggies and drain/dry your shirataki noodles and any other add ins (for a Hawaiian take, add pineapple/papaya or Davinci SF Pineapple Syrup and for Mexican, add plum or Roma tomatoes, salsa, and crackers/tortilla's at the end- guiltless gourmet and especially falafel chips are great alternatives-SEE REVIEW ON FALAFEL CHIPS HERE). Next, add Shirataki noodles to the Rainbow Salad, seasoning, add marinade or dressing , baby carrots and microwave for another 5 or so minutes (until carrots are soft). Add as many slices of cheese as you want (I ripped about 4-5 up and made sure to distribute them throughout the bowl). Cottage cheese works great, as it will melt nicely and cover the items in the bowl. Microwave until cheese is either melted or bubbling. Add fresh veggies to bowl and mix. For Mexican add tortillas, salsa, lettuce, onions, ground turkey or veggie crumbles/tofu. You can also make your own tortilla chips by browning/crisping tortillas/wraps such as Mama Lupe's, La Tortilla , or any of the healthier Low Carb wraps or Flat out wraps/pitas/lavash out there. Feta, Garlic, Lemon, Tomatoes and Onions and Olives give it a great Greek spin, with Olive Oil, lemon juice, garlic, oregano. Asian, add sweet peas, snap peas, baby corn, water chestnuts, mung beans, bok choy, onions and mushrooms. Adding Squash/Zucchini, Garlic is fantastic as well. I always add GG Scandinavian Crisp Bread to my bowl, and douse the entire bowl with more Kikkoman Low Sodium Soy , and any dressing I feel like at the moment. I then pour a bowl of my famous Salsa/Mustard dip, grab about 20 sheets of Nori Sushi Seaweed, which I then tear up into 4ths, and wrap the contents of the bowl in the Nori (like mini wraps). Delicious. Adding Mushrooms and Basil/Oregano are highly recommended! Besides tasting like something out of a 5 star restaurant (souffled type flavor- even better when broiled in the oven if you have time), it is quick and easy to augment and prepare. This is a great way to get your veggies in, clean out your fridge and get some added nutrients and fiber into your diet. Above all, it is satisfying, warm, delicious and comforting! Perfect for winter or anytime! I recommend serving and eating this from a huge glass bowl - the colors are beautiful! Eating different vegetables in a meal can definitely give you the nutrients you need. Thanks a lot for sharing your insights.